As tanks generally do, Fury rolled over the competition this weekend, knocking Gone Girl from the No. 1 position with $23 million in ticket sales. 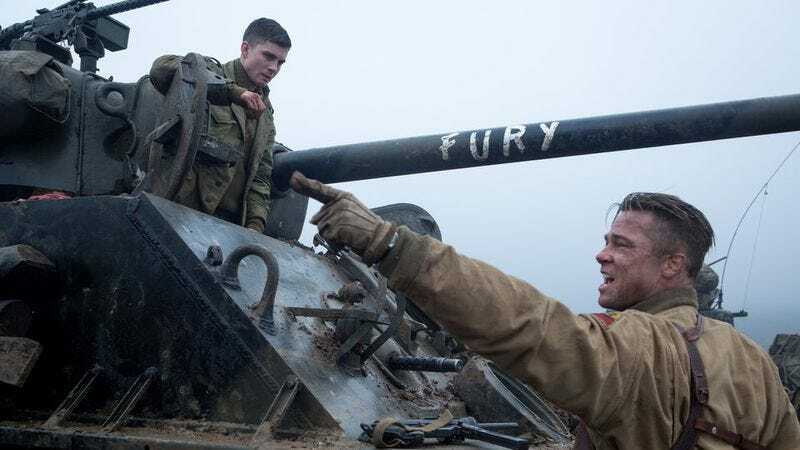 Brad Pitt’s gory WWII movie, with all its attendant manly nicknames and graphic decapitations, unsurprisingly skewed older (51 percent of moviegoers were over the age of 35) and male (60 percent). But Gone Girl still held strong at No. 2, pulling in an additional $17.8 million to bring its total to $107 million, a very respectable number for a movie with neither superheroes (future Batman excepted) nor things only ‘80s kids understand (’70s and ‘90s kids also have marriage problems, presumably) in it. A similar dynamic played out in the kids’-movie world as Guillermo Del Toro-produced newcomer The Book Of Life took the No. 3 spot, knocking Alexander And The Terrible, Horrible, No-Good, Very Bad Day down to No. 4. The Book Of Life pulled in $17 million, on par with The Boxtrolls’ $17.3 million debut last month, both impressive showings for animated films released without the support of the Disney/Pixar hype machine. But despite its title, Alexander is doing fine, having pulled in $36 million on a $28 million budget before the movie hits the “Mommy really needs 90 minutes of quiet” home-video stage. Speaking of bad days, Annabelle dropped from No. 4 to No. 8 this weekend, a dramatic 50 percent decline—but considering the movie has already made $74 million on a $5 million budget, James Wan and company can afford to step back and let another horror movie have a little bit of fun. However, that other horror movie was the dreary Dracula Untold, which dropped from No. 2 to No. 6 as moviegoers donned wreaths of garlic and threw holy water at the idea of Dracula as Batman-esque dark guardian. $9.8 million is the box office Universal deserves, if not the box office it needs right now. Finally, the romance appears to be over as The Best Of Me opened to $10.2 million, the worst opening weekend ever for a Nicholas Sparks movie. Sparks wrote America 365 letters, one for every day of the year, but America couldn’t wait forever. Now Sparks will have to win America back via a soft-focus montage involving a tire swing and kissing in the rain, before they die together in a canoeing accident or whatever.